“Momento.” Aldo CLEMENTI: Satz (1998); Satz 2 (2001); Canone (1997); Tribute (1988); Momento (2005); Reticolo: 4 (1968); Otto frammenti (1978-97). Quatuor Bozzini: Clemens Merkel, Erik Carlson (vln), Stéphanie Bozzini (vla), Isabelle Bozzini (vlc). 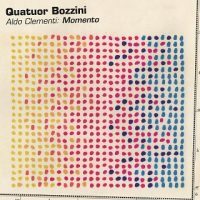 Collection QB CQB 1615 (1 CD) (http://www.quatuorbozzini.ca/). To say Aldo Clementi uses canons, is like saying Wagner wrote operas or that Beethoven was good at variations. Clementi’s elegant constructions use all manner of repetitions at different speeds and intervals. It may be hard at first to catch the structure because of the alternately knotty and playful tapestries, so well does Clementi’s music deliver mesmerizing events. Some pieces are long; the wintry Momento is 18 minutes, whereas we get two versions of the flowering Canone which takes about 75 to 80 seconds per pass. These extracts from Otto frammenti last 22-and-a-half minutes and contain a contradictory subtitle, “canoni 1-8, 33-40,” which suggests that the eight fragments are repeated or perhaps that they embed a subset. In fact, the entire work rich in palindromes explores the possibilities of the 15th-century tune L’homme armé. The slipcase provides this telling artistic statement: “It has been my conviction for a number of years that Music (and Art in general) must simply assume the humble task of describing its own end, or at any rate its gradual extinction.” Imagine music boxes winding down after an intricately designed maximal moment. Taken together, this quartet program is powerfully autumnal. The Bozzini’s superbly blended colors have been mentioned before, and here they create galaxies that wobble before receding. Salvatore SCIARRINO: Cantare con silenzio (1999)1; Berceuse (1967-69)2; Libro notturno delle voci (2009)3. 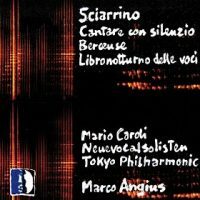 Mario Caroli1,2,3 (fl), Alvise Vidolin1 (electronics), Neue Vocalsolisten1, Tokyo Philharmonic Orchestra1,2,3, Marco Angius2,3 (cond.). Stradivarius STR 33987 (1 CD) (http://www.stradivarius.it/). Cantare con silenzio appears to be a five-part 40-minute cantata for six virtuosic voices with percussion, solo flute and electronics. At several points you might hear a muted orchestra trapped within the ghostly electronics. As we expect from Sciarrino, gestures are boldly fragile, except when someone spins out of control and threatens to shatter everything in reach. Texts originated from Michel Serres, Edgard Gunzig and Isabelle Stengers are set using Sciarrino’s distinctive patter that obscures meaning through syllabic repetition. The flute provides breathy tones and air-gun noise blasts, enchanting as much as it terrifies. Berceuse is an 11-minute whirl, albeit, any ensuing sleep would trigger nightmares and chills. This is its premiere recording and it is perhaps the earliest Sciarrino effort on record. The notes indicate that multiple orchestral choirs are at work which suggests a predisposition for denseness. However, the orchestra lunges in and out of focus via long silences. Written specifically for Caroli, Libro notturno delle voci pushes the flute forward, but isn’t really a concerto. The soloist comments elusively upon the orchestra’s lethargic awakening with overblown and breathy tones, whispering and piercing high notes. The initial movement contrasts flute against sluggish cellos (they sound like basses but the booklet states cellos) fidgeting with a distinctive Sciarrino shape: a quick slide into a note, then a slow tapering away at the end. The second movement increases the tension: An agitated background may retort impulsively, like easily angered bees. Caroli has recorded Libro before, with the SWR Sinfonieorchester Baden-Baden und Freiburg led by Beat Furrer for NEOS 11051. The first recording is longer, but this one doesn’t feel faster or rushed. 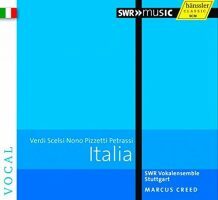 “Italia.” Giuseppe VERDI: Ave Maria (1889) and Laudi alla Vergine Maria (1886-88) from Quattro Pezzi Sacri (1898); Pater noster (1873). Giacinto SCELSI: Yliam (1964); TKRDG (1968)*. Luigi NONO: Sarà dolce tacere (1960). Ildebrando PIZZETTI: Tre composizioni corali (1942-43). Goffredo PETRASSI: Nonsense (1953, 1967). Hubert Steiner* (e-guit), Boris Müller*, Martin Homann*, Adam Weisman* (perc), SWR Vokalensemble Stuttgart, Marcus Creed (cond.). Hänssler Classic 93.329 (1 CD) (http://www.haenssler-classic.com/). Italian choral music might unify these pieces; indeed, I don’t think Scelsi and Verdi could otherwise ever share the same program unless perversity prevails. Ages ago, Verdi’s Quattro Pezzi Sacri were an oasis in my listening diet among an intense period of electronic music. They possess the restorative ability to slow the pulse. The Ave Maria employs a so-called enigmatic scale (C-Db-E-F#-G#-A#-B-C) which perhaps coincidentally Nono also found appealing and used in his late pieces but not in the pointy Sarà dolce tacere with its tightrope pitches and abrasive clusters. The Scelsi items, Yliam, for women, and the three-part TKRDG, for men with electric guitar and percussion, suggest a 1960s free spirit. Contrasting Scelsi and Nono reveals that despite enormous ideological differences, together they explored similar sonic frontiers while demanding precise execution. Yliam approaches electronic textures with its sliding tones; TKRDG appears to use only those five consonant sounds. The drums and electric guitar outline a primitive language. Pizzetti’s three pieces are conventional and forgettable, quickly becoming sweetly formulaic. It is instructive to note how Verdi’s varied handling of swells, canons and changing note durations is far more sophisticated than Pizzetti’s square treatment. Following these three with Scelsi’s TKRDG makes a wicked contrast. Petrassi’s five pithy Edward Lear settings utilize contemporary colors, even as No. 5 retreats to Orff. “Italian Orchestral Works.” Giacomo PUCCINI: Preludio sinfonico (1882)1. Gioachino ROSSINI: Bassoon Concerto (1845?) 2. Giuseppe VERDI: Capriccio for Bassoon and Orchestra (1838?) 3. Niccolò PAGANINI: Concertino for Horn, Bassoon and Orchestra (1831?)4. ROSSINI arr. Ottorino RESPIGHI: La boutique fantasque (1919; arr. Malcom SARGENT)5. 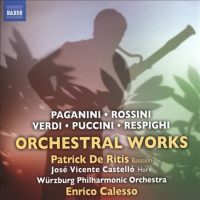 Patrick De Ritis2,3,4 (bsn), José Vincente Castelló4 (hn), Würzburg Philharmonic Orchestra, Enrico Calesso (cond.). Naxos 8.573382 (1 CD) (http://www.naxos.com/). Before receiving this disc, I did not know that Rossini wrote a bassoon concerto. I also did not know that Verdi created one as well, and of course, had no idea that Paganini composed a concerto featuring bassoon and horn. The Rossini may be spurious. Possibly an examination concerto, it is dated ca. 1845, well after Rossini retired from composing operas. Fairly classical, the concerto’s counterpoint and structure don’t conveniently align with the composer who also wrote the clever and varied Péchés de vieillesse. The Verdi Capriccio is a curiosity, somewhat meager, and if really Verdi, then an early piece written in his mid-twenties. However, the unlikely Paganini double concerto, with barrel organ pizzicato accompaniment and cheerful orchestral punctuations does seem a distant relation to the familiar violin concertos. Paganini wrote it for a French bassoonist, Antoine Nicholas Henry, and it is sometimes called the “Mr. Henry” concerto. The Puccini and Respighi are more familiar. Puccini’s Preludio was written at the age of 24, perhaps inspired by Wagner, and in it we hear the lush hallmarks of the mature operatic composer. Puccini came from a very long line and extended family of church musicians, and his exploration of secular music broke from ancestral tradition. Respighi orchestrated sundry Rossini baubles for a ballet from which Sargent compiled this suite. Say what you wish about Respighi’s orchestrations in general, but in this case Rossini provided quite clever ingredients. De Ritis is gallant; the Paganini Concertino is perhaps the finest piece here. Carlo GESUALDO: The Complete Madrigals (Books I, II: 1594; III: 1595; IV: 1596; V, VI: 1611). Delitiæ Musicæ: Alessandro Carmignani, Paolo Costa, Jacopo Facchini (c-ten), Fabio Fùrnari, Paolo Fanciullacci, Raffaele Giordani (ten), Marco Scavazza (bar), Walter Testolin (bass), Carmen Leoni (hpsi, org), Claudio Pasetto, Leonardo Bortolotto, Teodoro Bau, Luciana Elizondo (viols), Marco Longhini (cond.). Naxos 8.507013 (7 CDs) (http://www.naxos.com/). Whether examined cursorily or in detail, Gesualdo’s music remains wondrously unfathomable because it drifts assuredly across our modern understanding of tonality and harmony. Of course the Don’s life (see http://www.lafolia.com/armchair-operas-6/) colors the music in a way which cannot be separated from its beauty and recurrent strangeness. The continual tempo fluctuations alone suggest a perverse disregard for stanzas still fresh in the ears. I can’t fathom how Gesualdo can be both sensual and fickle in the same phrase, but then again, I don’t want to understand as that would ruin the magic and dampen the surprises. Delitiæ Musicæ’s traversal of all six books is consistently clear and painstakingly detailed. The recording quality is superb. 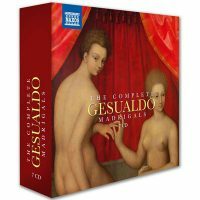 Gesualdo’s gorgeousness shocks at every turn; these seven discs (56:15 + 57:12 + 68:37 + 68:59 + 74:10 + 67:09 + 41:21) and an 88-page booklet collected together in a sturdy box are a secret treasure in my collection. 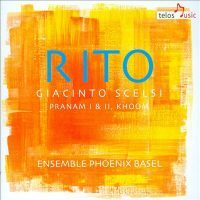 “Rito.” Giacinto SCELSI: Pranam I (1972)*; Pranam II (1973); Khoom (1962)*; Riti: I funeral di Alessandro Magno (1962); Okanagon (1968). Marianne Schuppe* (sop, alt), Ensemble Phoenix Basel, Jürg Henneberger (cond.). telos music TLS 191 (1 CD) (http://www.telosmusic.de/). Steeped with temperance, Ensemble Phoenix Basel avoids the histrionics which saturate other Scelsi interpretations. Perhaps absent zaniness, Scelsi loses some of his uniqueness. We hear instruments on the same plane, nothing overwhelming or unduly frenetic; garish effects and frilly twitches are avoided. You might never suspect that these pieces were composed by a man who forbade photos of himself, waded deep into Oriental philosophy, and had amanuenses transcribe taped improvisations. The music is still out of the mainstream, but whether constructed by assistants or Scelsi, the timbres and content never fail to interest. Alfredo PIATTI: 12 Caprices for Solo Cello, Op. 25 (1865). Carmine Miranda (vlc). Navona Records NV5972 (1 CD) (http://www.navonarecords.com/). 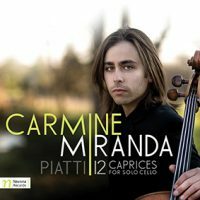 Miranda makes a vigorous case for these unfamiliar melodious and difficult Caprices. Paganini was an influence, however the 19th-century Italian cello virtuoso employed harmonic patterns that reach back to Bach, and he was not afraid also to offer operatic melodies. The close recording captures immediacy, including Miranda’s whispering tones in high tenor passages.